You have to hand it to Paula McClain. 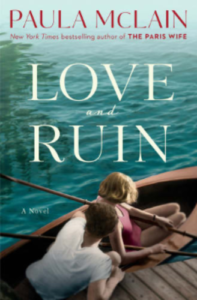 After writing The Paris Wife, a best-selling and very appealing account of Hemingway’s life with his first wife, Hadley, she’s managed to outdo herself with Love and Ruin, the story of Martha Gellhorn’s marriage to Papa H., a marriage that also came apart. It’s a great story. The author never fails to convince us that she’s accurately reflecting the consciousness of the woman whose life she recreates and, from time to time, Hemingway’s consciousness as well – three or four times his viewpoint takes over the narration. The setting does a lot of the work here. It’s the Spanish Civil War. Hemingway and Gellhorn, both war correspondents, belong to a group of journalists who are following the action from place to place – it’s exciting and gritty – and, as you might expect, though he is married to his second wife, Pauline, they fall in love. It’s as romantic as can be, and as heart-breaking. The romance making the heartbreak more real, and vice versa. After the war ends, the backdrop moves to Cuba, redolent with atmosphere, and the story of their lives unfolds – the hostile relationship with Pauline and the tender one with Hemingway’s sons from his first two marriages, Martha’s struggle for independence, Hemingway’s titanic effort to complete For Whom the Bell Tolls, the book’s spectacular success. The couple spend time in Sun Valley where Hemingway is the toast of the celebrity crowd, a situation he enjoys and Martha detests. She takes an assignment from Colliers, he resents her absence, her first collection of stories tanks in the media, things deteriorate. What impressed me was the way McClain conveys the psychological dynamic between the two writers: his need for support, adulation, and constant companionship, hers for independence and the opportunity to pursue her career. Neither is willing to compromise. They’re devoted to one another but unable to make room for each other’s compulsions. They fight, make up, and fight again, their disparate needs having put them on a collision course that no amount of romance can overcome. Ultimately, in a mood of bitterness and hurt, Hemingway rejects Martha for failing to meet his requirements, and she goes her own way, devastated, but unable to sacrifice her ambition to his desires. A classic twentieth century male-female impasse. While not unsympathetic to Hemingway, McClain’s account of the relationship is tilted in Gellhorn’s favor, offering a feminist perspective on the marriage that I found persuasive. Still, the deeper message concerns the tragic incompatibility of two passionate, talented, dedicated, and fundamentally generous people. It’s not so much a question of who’s right and who’s wrong, or of who occupies the moral high ground, as it is of the basic unsatisfactoriness of things, or to put it another way, the failure of the universe to give us what we want. From another perspective, it’s the story of how great work gets done in the teeth of disappointment, struggle, unhappiness, and emotional shipwreck. As we know, after a life of popular and critical success, having produced a body of work that exerted a profound (and, to my mind, not altogether positive) influence on American writing, Hemingway killed himself at the age of 62. The big surprise is Gellhorn. She, it turns out, is one of the unsung heroes of her generation, an Eleanor Roosevelt figure, the Christiane Amanpour of her day. So why had I never heard of her, except as one of Hemingway’s wives? We learn at the end that Gellhorn, whose position as war correspondent for Colliers had been usurped by Hemingway, stowed away without papers on a hospital ship bound for the D-Day invasion and was the only woman among a hundred thousand men on Omaha Beach that first night (she immediately became part of the rescue operation) and the first journalist, male or female, to report back. She was arrested and sent back to London and went on to have a stellar career, reporting, during World War II, from Belgium, Norway, Germany (notably Dachau and Bergen Belsen), China, Finland, Italy, and Czechoslovakia, and from war zones all around the world, including Vietnam, until the age of eighty-one. She had a successful career as a writer, publishing five novels, fourteen novellas, two collections of stories, and three collections of essays.